When the MAKEUP WARS! Team decided to feature each of our favorite makeup brushes, I knew that I had to partake– because I have a nearly irrational love of makeup brushes, and while I have accumulated more than I could ever need or use– I knew that there were three brands that I use all of the time, and that warranted being a part of this feature. I had pondered washing all of them for you, but then it occurred to me that showing them filled with pigment would give you a more accurate view of how well loves these brushes are! I don't know why I don't talk more about my TOM FORD makeup brushes, but they are among my most coveted, and indeed most used, makeup brushes. Their quality is exquisite, they are perfectly balanced, and using them is a true joy. They are definitely ultra-luxe, but it was money well-spent given how often I actually use them. Most of the TOM FORD brushes are made from natural (goat, I believe) hair with wooden handles and rich golden ferrules. There are a few synthetic brushes in the collection, but I do not have any of them. TOM FORD Beauty Bronzer Brush ($115.00 from Nordstrom, Neiman Marcus, Bergdorf Goodman, Bloomingdale's, Saks Fifth Avenue and Harrods): While this colossal brush, with its largely fluffy bristles, is perfect for applying bronzer with a light hand, it also does an exemplary job applying setting powder for a light finish. The bristles are soft and silky-smooth against the skin, and experiencing it is a decadent, luxurious experience. Disperse powder evenly all of your face with the bronzer brush by Tom Ford. The soft, natural hair bristles are designed to pick up the optimal amount of product so you achieve gorgeous, radiant skin. You can also use it as an allover face blending tool to smooth lines after makeup application. TOM FORD Beauty Cheek Brush ($78.00 from Nordstrom, Neiman Marcus, Bergdorf Goodman, Bloomingdale's, Saks Fifth Avenue and Harrods): Oh how I love this brush, and as you can see from the group picture above (second brush from the left) mine is well used and loved. This brush picks up and lays down blush with precision, and it blends it to absolute perfection. While I have a huge number of blush brushes, this is my most reached for, and most adored among them. Achieve concise and effortless cheek color application with an ultrasoft, natural hair brush by Tom Ford. It's designed for versatility, enabling you to layer color to your desired intensity or sheer it down to transparency. TOM FORD Beauty Cream Foundation Brush ($72.00 from Nordstrom, Neiman Marcus, Bergdorf Goodman, Bloomingdale's, Saks Fifth Avenue and Harrods): There is no question that this foundation brush does an exemplary job applying and blending cream and liquid foundations, but is also does an extraordinary job with cream and powder blushes as well. In fact, the smaller head size makes it a great tool for applying luminizers, highlighters and just about anything else that I have tried. The Tom Ford cream foundation brush with its natural hair bristles is the perfect brush for the application of creamy foundation. It blends the product into your skin flawlessly so it looks invisible and your skin looks gorgeous. TOM FORD Beauty Eyeshadow Brush ($56.00 from Nordstrom, Neiman Marcus, Bergdorf Goodman, Bloomingdale's, Saks Fifth Avenue and Harrods): This soft brush picks up shadows and deposits them effortlessly, and then blends to perfection. It is, without question, my go-to brush for laying down a nice wash of color. It is, in my estimation, the perfect eyeshadow brush. The paddle is large enough to grab the shadow, and soft enough to blend. Sometimes it is the only brush that I use! The Tom Ford eyeshadow brush features natural hair bristles designed to give you a soft, allover eyeshadow effect. It picks up color with ease and glides it effortlessly onto your skin for beautiful makeup application every time. TOM FORD Beauty Eyeshadow Blend Brush ($56.00 from Nordstrom, Neiman Marcus, Bergdorf Goodman, Bloomingdale's, Saks Fifth Avenue and Harrods): This eyeshadow blending brush not only does what its name suggests, but its tapered bristles facilitate the application of a contour color in the socket of the eye. The eyeshadow blend brush by Tom Ford creates perfect shade gradation for a flawless look every time. It's made with natural hair bristles to ensure soft application and precision blending with a range of differently textured eyeshadows. TOM FORD Beauty Smoky Eye Brush ($52.00 from Nordstrom, Neiman Marcus, Bergdorf Goodman, Bloomingdale's, Saks Fifth Avenue and Harrods): The Smoky Eye Brush certainly makes easy work of its namesake look, but this pencil shaped brush also does an enviable job smudging eyeliner– which is what I most often use it for. The Smoky Eye brush by Tom Ford is designed to give you beautiful, dramatic eyes for a head-turning look. Winner of Allure magazine’s 'Best of Beauty' Award for Best Eyeshadow Makeup Brush, 2014. TOM FORD Beauty Eyeshadow Contour Brush ($56.00 from Nordstrom, Neiman Marcus, Bergdorf Goodman, Bloomingdale's and Harrods): This amazing multi-tasker can be used to lay down color in the crease and corner of the eye, but I have also found that it is also quite useful in applying a thicker cat eye liner as well. It has an angled, and slightly beveled edge that makes it quite effective! The Tom Ford eyeshadow contour brush is crafted with natural hair bristles to ensure flawless eyeshadow application on both the crease and corner of your eyes. TOM FORD Beauty Eyeliner and Definer Brush ($52.00-$88.00 from David Jones and Tom Ford Beauty): I noticed that most retailers seem to have sold out of this amazing brush, and that is making me think that I need to buy a back-up since it is one of my all-time most used makeup brushes! This is the brush that I reach for every single time that I apply a gel or powder eyeliner. It is the perfect size and shape to create a perfect cat eye effortlessly! Tom Ford's brush collection is designed to bring ease and luxury to the process of creating your look they make expert makeup application completely effortless. Line and define the eye with perfection with the Tom Ford Eyeliner and Definer brush, made with natural hair. Designed to ensure an absolute precise line, it may be used with powder eye shadow and/or Tom Ford''s Noir Absolute. Handle is designed for true comfort and balance. 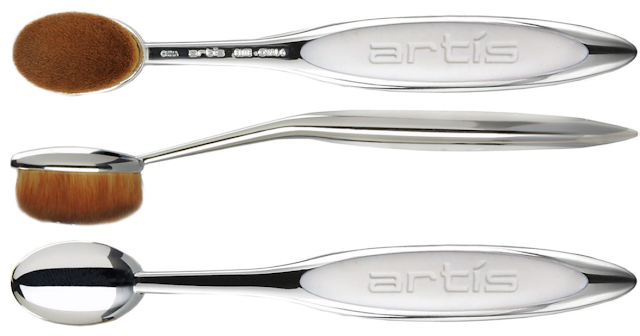 Artis brushes are so wildly popular that it seems as though more and more companies have sought to copy their amazing quality brushes. I have quite a few of them, but these three brushes, discussed below, are my most reached-for among them. Artis Palm Brush ($65.00 from Space NK, Net-A-Porter, Saks Fifth Avenue, Anthropologie, Spring and Dillards): The Artis Palm Brush is essentially the Oval 10 Brush without the handle, and while the Oval 10 has been among the holiest of holy grail brushes for me– I must say, without reservation, that I actually prefer the Artis Palm Brush. Both cover the same surface area, both feature the densely packed cruelty-free CosmeFibre bundle brush head, and both are astonishingly soft against the skin. The primary difference is that the Artis Palm Brush offers greater control and efficacy because there is no handle to that diffuses control of the brush. It fits effortlessly, and comfortably, in the palm of your hand and is so easy to use. It blends and buffs effortlessly, and the shape, size and lack of a handle considerably enhance the efficacy of this hard working brush. The size of both the Artis Palm and Oval 10 brushes are absolute perfection for blending foundations and finishing powders on the face. Not only are they ultra effective, but they also feel utterly divine against the skin. 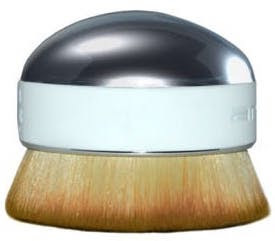 Artis Elite Oval 10 ($77.00 from Space NK, Net-A-Porter, Saks Fifth Avenue, Spring, Harrods and Dillards): The Oval 10 is a very large oval brush, as the name suggests, that boasts an extraordinarily densely packed head of bristles. Yet it is so soft to the touch, and feels so amazing as it caresses the skin, that I find myself seeking excuses to use it even when I don't actually need to. This brush was created to apply setting powders and powder foundations to the face, but it can also apply shimmering luminizers to the face and body. In addition to being a perfect choice to apply powder-based products it also does a phenomenal job applying foundations, tinted moisturizers, and BB and CC Creams. This brush effortlessly creates the most amazing airbrushed finish, and because of its large surface area it does so swiftly and to absolute perfection. It feels more heavenly against the skin than any other brush that I have tried– there is just something absolutely amazing about how soft and silky it feels against the skin. Add to this that it is able to spread and blend liquid, cream and powder products to perfection, and one is left marveling at this visionary brush. One of the really superb design choices can be experienced in the flexibility of the handle that gently flexes as it glides across the skin rather than offering resistance. This very flexibility allows for even distribution and fuss-free blending and buffing of the products being used. 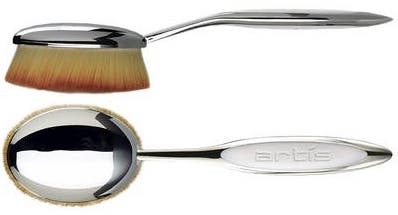 Artis Elite Oval 6 ($57.00 from Space NK, Net-A-Porter, Saks Fifth Avenue, Spring, Dillards and Harrods): Artis Oval 6 Brush boasts an extraordinarily densely packed head of CosmeFibres, and yet it is so soft to the touch. It feels amazing as it gently caresses the skin, and only the lightest touch is needed to get perfectly blended airbrushed results. This brush does a perfect job applying blush, setting powders, powder foundations and liquid and cream foundations to the face. Additionally, it can be used to apply shimmering luminizers and bronzers to the face with great precision. Some even opt to use this brush to apply a simple wash of color to the eyelids, but if you have small eyes this brush may prove to be a bit large for you. If you seek the perfectly sized brush to apply foundations, tinted moisturizers, and BB and CC Creams, then you will be tremendously impressed by the phenomenal job achieved by the Artis Oval 6. Given the sheer density of the CosmeFibres coupled with their remarkable silky softness, one is able to achieve the perfect airbrushed finish effortlessly. Some may have the tendency to apply more pressure than needed to compensate for the softness of the CosmeFibres, but this impedes the efficacy of the brush and may lead to pulling the skin. Instead, one only needs to use a light touch for maximum efficacy and stunning results. The handle is flexible, and therefore offers a very gentle application, and the ergonomic curved handle grip makes it very comfortable to hold. HOURGLASS is unquestionably one of my all-time favorite luxe makeup brands, and their brushes are just as fantastic! HOURGLASS Cosmetics Ambient Lighting Edit Brush ($46.00 from Hourglass Cosmetics, Space NK, Sephora, Barneys New York, Nordstrom, Blue Mercury, Net-A-Porter and Bergdorf Goodman): is a two phenomenal brushes in one that was created to use in conjunction with the Ambient Lighting Edit. The synthetic, Cruelty-Free brushes are the perfect size to fit in this palette, and boast the perfect shapes for flawless application. Both brush heads are soft enough to feel heavenly against the skin, but are firm enough to pick up and lay down pigment effortlessly and flawlessly. • The rounded end is ideally shaped for applying finishing powder and adding bronzer to the temples and hollows of cheeks, while the tapered side is shaped to flawlessly apply blush and highlighter. • Weighted metal handles provide control for effortless blending and application. • Perfectly sized to work with all Ambient® Lighting Palettes and travel-sized compacts. A multi-tasking brush featuring two versatile brush heads that can be used for an array of products including powder, blush, bronzer and highlighter. This double-ended brush can be used with powder, cream and liquid formulas for the most flawless finish. Perfectly-sized to be used with the Ambient® Lighting Edit. HOURGLASS Cosmetics Vanish Seamless Finish Foundation Brush ($46.00 from Hourglass Cosmetics, Space NK, Sephora, Barneys New York, Nordstrom and Blue Mercury): HOURGLASS Vanish Seamless Finish Foundation Brush ($46.00) is an ultra-soft brush with synthetic Taklon bristles that was specifically created to be used in tandem with the Vanish Seamless Finish Foundation Stick, and there is no question that they work exceptionally well together. The slightly angled brush head, that boasts very densely packed bristles, is very soft and smooth against the skin, and yet the sheer density of the bristles are firm enough to create a flawless airbrushed finish. Furthermore, the short handle, the brush is almost 4.5 inches long, allows for meticulous control of the brush– which facilitates perfect application. The results are consistently streak-free– whether the brush is used with Vanish Seamless Finish Foundation Stick, or any other foundation that I have tried, and it has quickly become my Holy-Grail foundation brush. Overall Assessment: These are my tried and true holy grail makeup brushes that get so much love from me. If you had to select your very favorite makeup brushes, what would they be? Press Sample and Purchased (Affiliate Links). Copyright © 2017 www.lolasssecretbeautyblog.com All Rights Reserved. Artis makes fantastic brushes!!! They are so satisfying to use! I think that you would really like this one, Kelly! It feels so great in the hand, and against the face! I'm drooling over those pretties from Tom Ford, Artis & Hourglass. I've never tried any of them. Some day! They are all very worthy of your consideration! These are definitely the brushes that get the most love from me! The Artis brushes look so nice. They really are, and they are such a treat to use! I would DIE to try out the Tom Ford! Ugh they look so good!!! You would lose your mind over them, Brooke! Great personal collection. My favorite brushes are Bdellium and Hakuhodo Brushes for eyes, hands down. Thanks, Norah! I have tons of Hakuhodo brushes too, and I really love them! Hakuhodo actually makes these TOM FORD brushes! I'd adore having your collection of Tom Ford brushes. I have lusted after these since I saw them in LA on a trip. I understand that there's a Tom Ford counter coming to the Nordstrom that's 10 minutes from my house. I guess I need to start saving now! I think that you will really be impressed by them! There is no way for you to get away from the counter with at least one of these babies! You are in so much trouble if you have TF counter coming to your local Nordstrom! My next plan is to buy Tom Ford brushes! You will fall madly in love with them, Kath! What an exquisite dream line up of brushes. My wish list just got longer. I think that you will fall in love with them, Erika! They definitely make me happy each time I use them! You just made my day! What a nice thing to say! I'm so sad I missed this weeks topic, I would have loved to participate! Artis brushes are on my wish list, I wish I could afford them! I would have loved to have seen your picks! You need at least one Artis brush in your life, you will LOVE them! Oh gosh, Tom Ford brushes? I wouldn't even know what to do with myself. I want them! That is precisely how I felt until I caved and bought them. Once I did that I became ever more obsessed with them! LOL!